Tea is everywhere. Whether we are talking about it's original form, or the many infusions we make with other herbs. Yes, tea is made from the leafs of a single shrub and everything else is an infusion. Camomile, Rooibos, lemon beebrush, are herbs used to make infusions, tisanes. We will be talking about the real deal here, the actual tea leaf. And you can't talk about tea without talking about the Japanese Tea Ceremony. Memory fails me about where I heard this, but I recall a story that Tea was discovered while an emperor was sitting under a tree and a leaf fell into a pot of water he was boiling. And from a childhood memory, I remember watching the Kung Fu series with David Carradine. In one episode it is mentioned the importance of having tea even in the most humble house. That way, there is always something to offer our guests or unexpected visitors as a sign we value their presence. Maybe these memories have decayed with time and I'm wrong. Yet since the ideas they convey are so wholesome, there is no reason why we shouldn't accept their message and carry it forward, even if they lack a basis of truth. On a more documented episode, the british custom of drinking tea was made popular by the Portuguese Queen Catherine of Bragança when she married Charles II of England. As in Asia, Europe also has it's way to prepare a cup of Tea. Boiling the water and carefully making a pot tea, where the water is properly filtered to keep away the leaves. This was the customary way of having tea that I grew up with. In Lisbon, and other places in Portugal if you ask for a cup of tea you are quickly served with a cup of scalding water a tiny tea bag and two packets of sugar making up a total of 20g. You get to choose between black, green, Camomile, and Lemon Beebrush if you're lucky. Some places did see the opportunity in this, having opened up to a wider offering of infusions and ways of serving the beverage. I can still safely say that I was, and in some ways still am, ignorant in all tea related subjects. My palate would always demand those 20g of refined sugar to handle the black tea, the twinings or the earl grey. My tongue was always burnt for not waiting long enough to let it brew. And yes, I do prefer coffee. The first time I was in Tunis I did notice how serious they take their coffee, and tea. 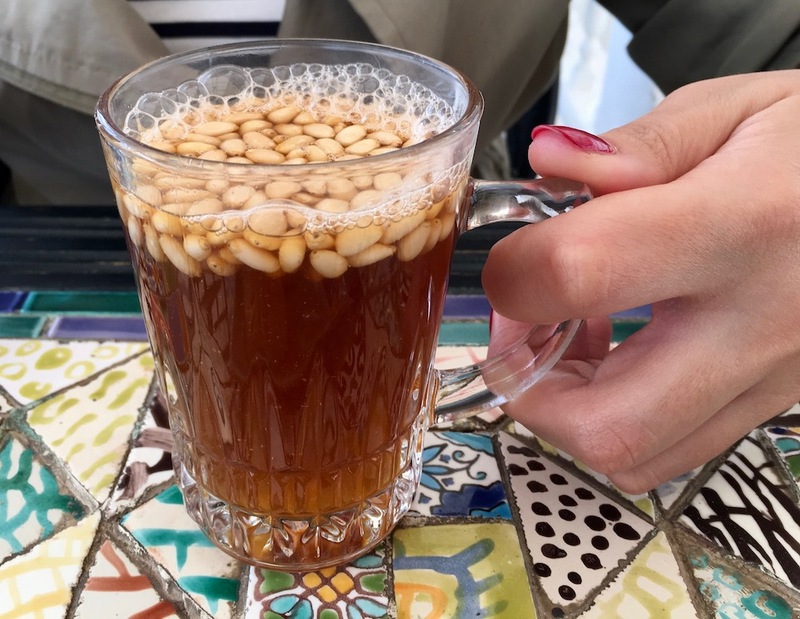 From walking down the street where people were casually holding cups of coffee or drinking tea with pepper mint, I can say the Tunisian do drink much more coffee than the Portuguese. Yes, some of us do drink six or more cups of espresso in a work day, but only half the size of a Tunisian cup of coffee. And the same is true about tea. There is a sort of machismo, of latin pride in not drinking tea. As a man you are strong! You drink coffee, the bitter the better, and sugar is not a part of your ritual! 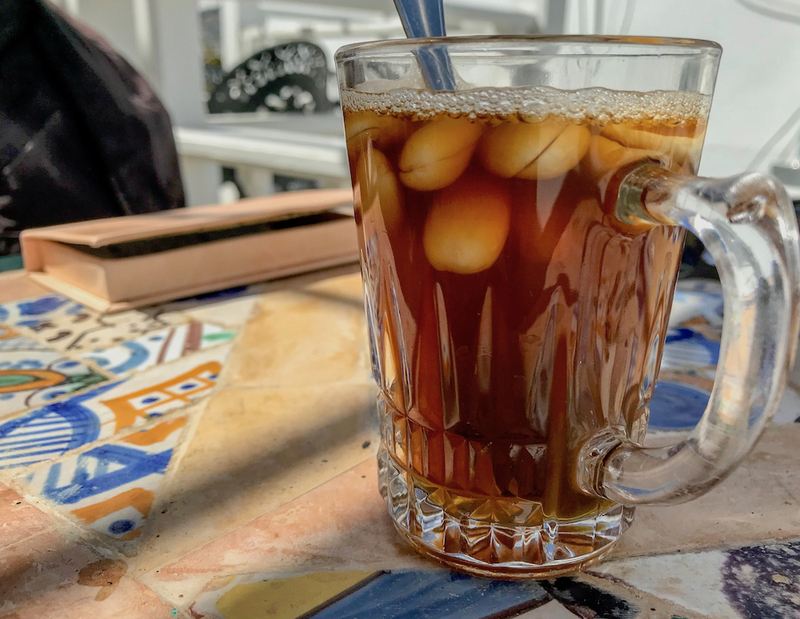 In Tunis, men sit on the coffee shops of the Medina smoking through a nargile (also called hookah) with a cup of coffee or black tea with mint leaves. And there, tea isn't served as in most Lisbon cafés. Here is your water, here is your tea bag, here's is your sugar. Enjoy! The tea will be presented to you ready to drink, in a glass with or without a handle, and where mint leaves have been added for extra flavour. Sugar is added as part of the boiling process of the tea, so it's naturally sweet. This way does give tea a different taste than if you add the sugar after. The tea is also prepared in a pot as opposed to added in a tea bag or infuser. I guess this will change the way the flavour evens out in the water, and it easily reminds us of how the Japanese prepare tea. And it doesn't stop there. Mint leaves are just the start. At cafés you can have green or black tea served with pine seeds or almonds. And in India we can find the traditional Masala Chai, with spices added for extra flavour. Pepper, Cinnamon, Nutmeg, Star Anise, the list is long and caters to all palates. From East to West, we have different ways to prepare tea, and a wide range of ways to extend it's original flavour. And in something this simple we can see a reflection of cultural aspects of each society. It's also curious to notice that the same herb, planted in different regions can be so different. Compared to the tea I usually buy, the one from Tunisia seems to be richer in flavour. Will this mean the start of an obsession with trying tea in all forms and flavours? No. It does mean a change of view and a wilingness to try different ways of preparing it as opportunities present themselves. There is a lot of culture in simple day to day rituals. And each time we run those motions we are passing that culture along, without realising where it comes from. We should look closer to these little things that are a part of our mundane activities and it won't hurt to question where they come from.